Beschorneria are a succulent plant from Mexico with Beschorneria yuccoides or ‘Mexican Lily’ being the most common in the garden. Beschorneria yuccoides is a clump forming evergreen perennial plant with tall flower spikes. 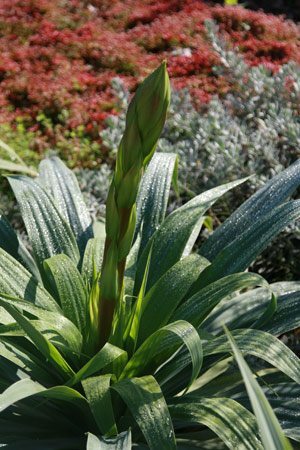 Although it has a ‘tropical look’ this is a fairly hardy plant with copes will cooler climates. Beschorneria yuccoides can look great in a large pot, its spiky foliage providing interest throughout the year. Long sword shaped foliage form a neat rosette and in itself the foliage make this an excellent landscaping plant in many garden styles. In spring the tall flower spike that emergres after a few years reaches high above the foliage with masses of pink flowers making a stunning attraction in the garden. Best in full sun although part shade during summer seems acceptable as long as winter and spring sun is good. Although Beschorneria yuccoides copes with a range of soil conditions it does prefer a humus rich fertile soil and will benefit from a slow release fertilizer applied in spring. Spent flower heads can be removed as needed. Beschornia variegata along with the cultivars ‘reality’ and ‘flamigo glow’ are forms with variagetd foliage, deep green and pale yellow, a striking landscaping plant. The tall pink flower spike is similar.